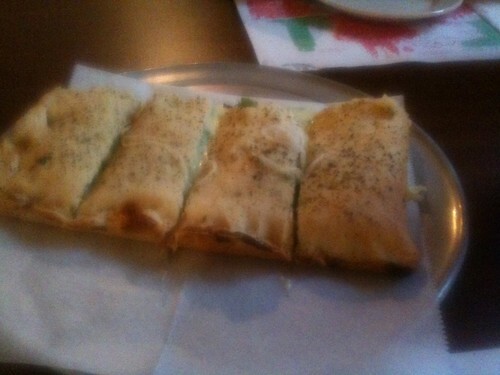 We stopped for dinner at Salerno's in Old Forge, Pennsylvania, because I was curious to sample Old Forge pizza. Service was horribly slow. It took us a long time to get menus, a long time before our order was taken, and a long time before our food was provided. We whiled away the time chatting with the folks at the next table, who were gathered to celebrate a nonagenarian's birthday. We ordered the stuffed white pizza with broccoli. Here's what's good about it: the crust was light and crisp and bit easily; if your stated task is "I want to eat a whole lot of gooey cheese with one hand", then this crust is absolutely the perfect bread for the job. Here's what's bad: the cheese was a mixture of mozzarella and American, and it had a lot of that unpleasant cloying quality that American cheese has at its worst. I'm glad to have tried it, and I respect it for how perfectly suited the bread is for its task, but I would think twice before ordering this again. 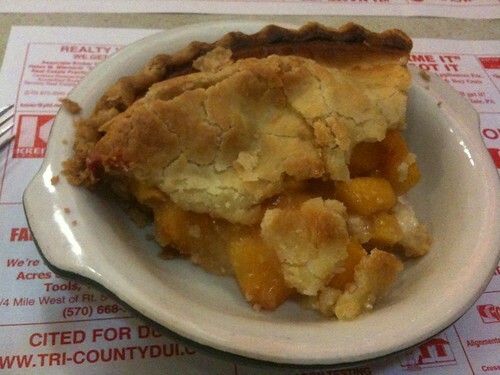 I ordered the peach pie. Most of it was pretty good, but some pieces of peach were rather hard and tasteless. 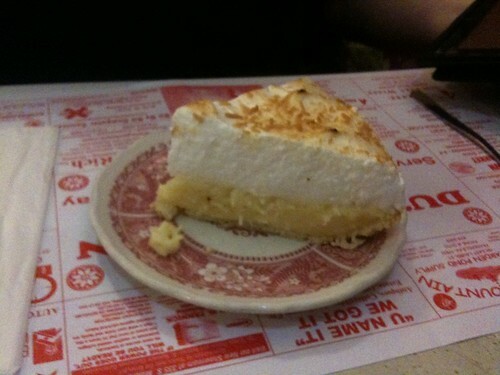 I've had far better pie at the Dutch Kitchen. We had accumulated enough delay on the drive (we got out from Webs later than intended, Salerno's service was glacial, we were slowed by very heavy rain on the interstate) that we didn't feel able to make it all the way home safely. We stopped at Breezewood, Town of Motels for the night, had an indifferent breakfast, and made the drive into Pittsburgh without me being too late for work.